The hydrangeas here in the south are starting to bloom in several different shades of blue and are beautifully striking or is that strikingly beautiful. Hydrangeas are fascinating in that, unlike most other plants, the color of their flowers can change or be changed by the grower.. It is not easy from what I have read. The people who have the most control over the color of their hydrangeas are those who grow them in containers. It is much easier to control or alter the pH of the soil in a container than it is in the ground. Hydrangeas often change color on their own when they are planted or transplanted. They are adjusting to the new environment. It is not unusual to see several different colors on one shrub the next year after planting. It is much easier to change a hydrangea from pink to blue than it is from blue to pink. 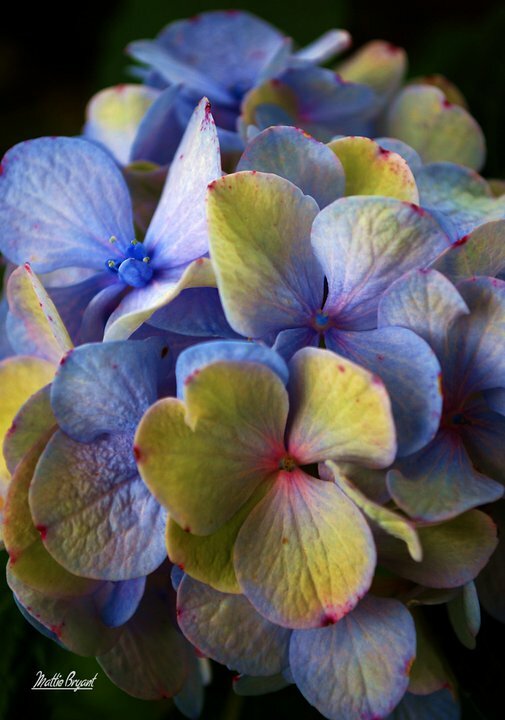 Changing a hydrangea from pink to blue involves adding aluminum to the soil. Changing from blue to pink means removing the aluminum from the soil or taking it out of reach of the hydrangea which if not in a container and just planted in the earth is much harder to do. Beautiful! Love the colour, light and shadows and texture.